Christopher Gable CBE was born in, March 1940, in London and studied at the Royal Ballet School before joining the Sadler's Wells Royal Ballet in 1957. He was promoted to soloist in 1959 and a principal in 1961. He left the Royal Ballet in 1967 to pursue a career in acting and appeared in a number of television and film productions including the BBC films Song of Summer (1968) and The Dance of the Seven Veils (1970), The Music Lovers (1970), an adaptation of The Boy Friend (1971), The Rainbow (1989) and the Cinderella film musical The Slipper and the Rose (1983). 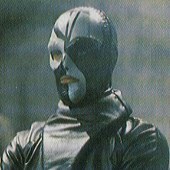 It was though in 1984 that he appeared in Doctor Who playing the part of anti-hero Sharaz Jek - his one and only appearance in the show. His involvement with Ballet continued when, in 1982, he founded the Central School of Ballet with Ann Stannard. Then five years later he was appointed Artistic Director of Northern Ballet Theatre. In 1996 Gable was awarded the CBE for his services to British Dance. Unfortunately though, in October 1998, Christopher Gable died from cancer aged 58. Although his motives and actions would normally make him The Doctor’s automatic enemy, Sharaz Jek proved to be a surprising ally to The Doctor in his last moments, and indeed generally treated The Doctor comparatively well during their acquaintance despite the fact that he was a ruthless gun-runner and drug-smuggler while The Doctor was only his prisoner. Originally a doctor with an appreciation for beauty, Sharaz Jek became interested in the manufacture of androids, an interest that lead him into a partnership with the businessman Morgus to harvest the valuable mineral known as spectrox, capable of extending the human lifespan if refined properly, which required androids to do the work as it was toxic to humans if handled incorrectly. Spectrox was found only on the planet Androzani Minor, a desert world of superheated mud subject to mud-bursts - molten geysers of mud erupting from deep within the surface - when it was particularly close to its parent planet of Androzani Major. Although their partnership initially progressed well for both Jek and Morgus, Morgus attempted to betray and kill Jek by supplying him with faulty detection equipment so that he would be exposed to a mud burst, the resulting blast leaving Jek disfigured even as he managed to retreat to a baking chamber. Seeking revenge for his disfigurement - which it was implied left him in continual pain from the burns, Jek commenting once that his hatred of Morgus and desire for revenge were all that sustained him now -, Jek used his androids to take control of the spectrox refinery stores, wearing a mask and bodysuit to hide his scarring. Jek was secure in his position despite the threat of Federal troops attempting to regain control of the spectrox stores, commenting that it would take them five years to seriously threaten him, and doubting that the electorate would wait that long when it could simply accede to his demands for Morgus’s head in its own blood. Unknown to Jek, Morgus was helping him maintain his position by indirectly supplying Jek with weapons to arm his androids against Androzani Minor’s forces, Jek paying for the weapons with spectrox that Morgus could then sell to Androzani Major at higher prices due to its scarcity. The Doctor became involved in Jek’s war when the TARDIS materialised on Androzani Minor and the Fifth Doctor and Peri were arrested on suspicion of being gun runners. Although Morgus ordered them to be immediately executed, Jek, starved of company and beauty and having developed an affection for Peri after witnessing her on his security cameras, was able to arrange for The Doctor and Peri to be replaced by android duplicates before their executions, in the hopes that he could preserve Peri’s beauty with spectrox and soothe his own loneliness. However, he was unaware that The Doctor and Peri had come in contact with raw spectrox earlier, thus unintentionally infecting themselves with spectrox toxaemia and leaving them only around a day to live unless they acquired the antidote. Learning from Major Salateen - one of Morgus’s closest associates whom Jek had replaced with an android some months back - that the cure for spectrox toxaemia required the milk of a giant queen bat from the lower caves of Androzani, The Doctor was forced to lead Peri and Salateen in an escape while Jek was away conducting a deal to try and recover the milk (The Doctor able to evade Jek’s defences as they were programmed to stop humans leaving and thus didn’t know what to make of his biology), only for Salateen to take Peri to the surface while The Doctor was forced to return to Jek when he was caught in the crossfire of a gun-runner deal gone wrong. Although The Doctor was to be taken to Androzani Major to be interrogated by Jek’s contacts there while Peri was held captive by Morgus’s men, The Doctor managed to escape captivity and take control of the ship he was on long enough to crash-land back on Androzani Minor, Jek managing to rescue Peri after Morgus killed the President to conceal his own recent failures. Despite Jek’s previous hostility towards The Doctor, when The Doctor returned to Jek’s base to recover Peri - fortunately arriving just after Jek’s androids had defeated Morgus’s latest attempt to kill Jek, although Jek had been briefly unmasked in front of Peri during the fight -, Jek provided The Doctor with the oxygen equipment and directions he needed to recover the bat’s milk. Although now actively resisting his body’s desire to regenerate as he couldn’t afford the time it would take him to recover and save Peri, The Doctor was able to find the milk he needed. Meanwhile, Morgus was finally betrayed by his secretary, leaving him with seventeen counts of arrest arrayed against him and deprived of his private funds, forcing him to try and attack Jek’s lair directly in a desperate attempt to liberate the spectrox supplies and redeem his reputation. As he worked to keep Peri cool in the lab, Jek was confronted by Morgus and his last henchman, Jek unmasking himself as he vented his rage at Morgus before being shot by Morgus’s henchman. As his last android killed the henchman, Jek forced Morgus’s head into the extractor fans before dying in the arms of his most accomplished android, The Doctor returning to the base with barely enough time to take Peri away before it was destroyed by a mudslide. Although Jek’s temper and insanity made him a danger to those he perceived to be his enemies, when faced with an immediate need to make the right decision he was able to put aside his anger and pain long enough to help The Doctor, and even his vendetta showed a certain sanity as he mainly directed his rage against a greedy, cruel man who unquestionably deserved his fate.